Location: From the intersection of Hwy 45 and Hwy 70 on the east side of Eagle River, continue east on Hwy 70 about 9 miles to Forest Road 2178. Turn south on Forest Road 2178 and continue about 3 miles to Forest Road 2181. Turn south on Forest Road 2181 and continue about 5 miles to the campground. Take the time to stroll along the “Avenue of the Giants.” Enjoy northern hardwood, pine and hemlock forests with some trees over 400 years old. A short loop at the start of the trail is wheelchair accessible. Parking area (sticker required) is located beyond the Franklin Lake boat landing off Forest Road 2181 on the right. 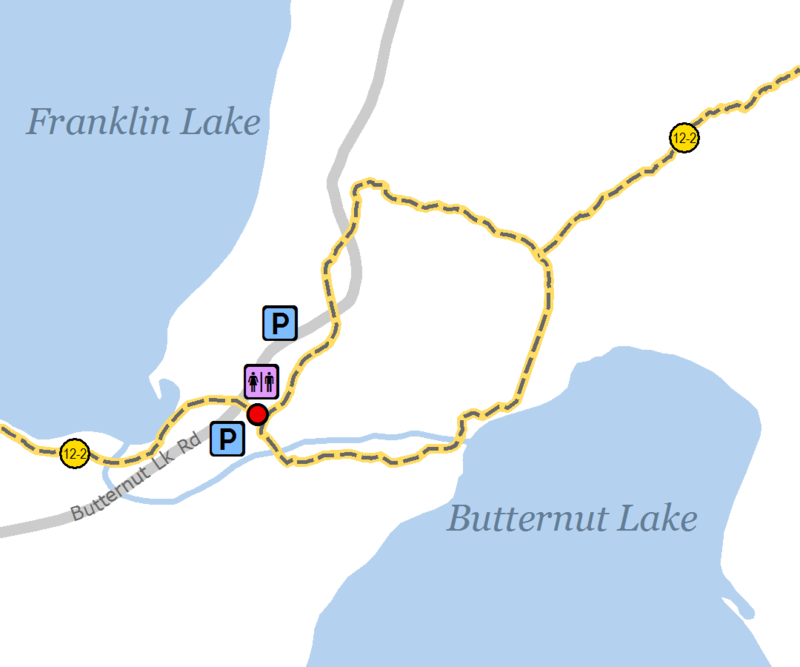 Part of the Nicolet National Forest, Franklin Lake Trail is the trailhead for Hidden Lakes Trail. *Pets not allowed on groomed ski trails.